CapriPlus is a natural mycostatic complex providing a broad spectrum of high potency antifungal nutrients with anti-Candida albicans specificity. Caprylic acid and sorbic acid are fatty acids demonstrated to control both the yeast and fungal forms of this organism. Odorless garlic is included for its widely-researched anti-fungal properties. Oil of oregano contains a complex mixture of highly active terpenoids and phenolic compounds known to exert strong antimicrobial activity. Importantly, CapriPlus tablets are enterically coated for optimal intestinal release and patient compliance. 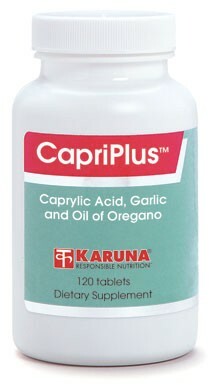 Caprylic acid has long been known as an effective inhibitor of Candida albicans in the human intestinal tract without undesirable side effects (Arch Intern Med 1954, pp. 55-60). Sorbic acid is another agent with anti-Candida activity (J Appl Bacteriol 1983;54:383-9) that has lowered intestinal yeast counts in animal studies (Poult Sci 1985;64:832-40). Oil of oregano has been identified as one of the most potent antifungal essential oils ever tested, superior to both tea tree oil and caprylic acid (Antimicrob Chemother 1998;42:591-5); J Applied Nutr 1995;47:96-102). Garlic, another potent antifungal agent, has been shown effective for inhibiting intestinal Candida growth in animal studies (Br Vet J 1980;136: 448-51). 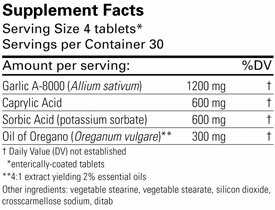 Suggested use for adults: Four tablets divided over one day, taken on an empty stomach, or as directed.